We could have told you......hello, it is in the pink family! 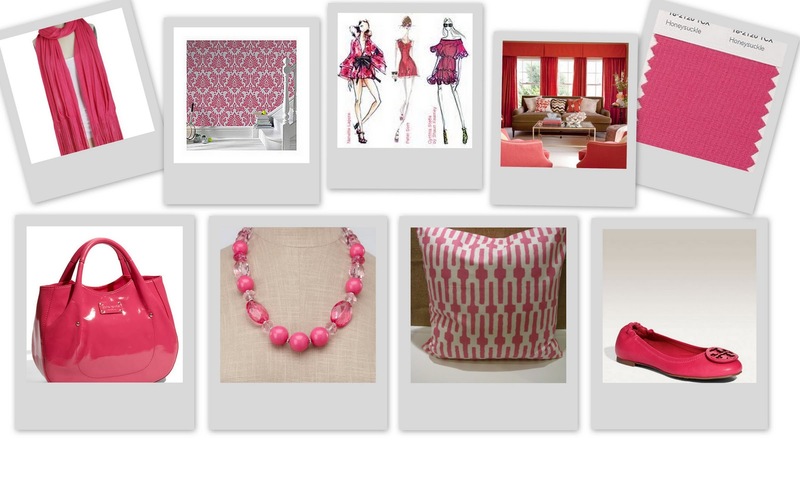 Pantone just announced the 2011 color of the year and well, we couldn't LOVE it more! Also, because it is very close to what our new website color will be! Honeysuckle is the color cupcakes! What's not to love? Courageous. Confident. Vital. A brave new color, for a brave new world. Let the bold spirit of Honeysuckle infuse you, lift you and carry you through the year. It’s a color for every day – with nothing “everyday” about it. Monkey-Toes Outlet! Get your shop on! Our FAB writer, Jenny Ford, owns a FAB little company known as Monkey-Toes! Well, they have HUGE and we mean HUGE amazing changes (we are so proud of her!) and because of these changes - all of your favorite Monkey-Toes are on sale! Head over to the Monkey-Toes outlet now and get them while you can! Most prices are over half off! 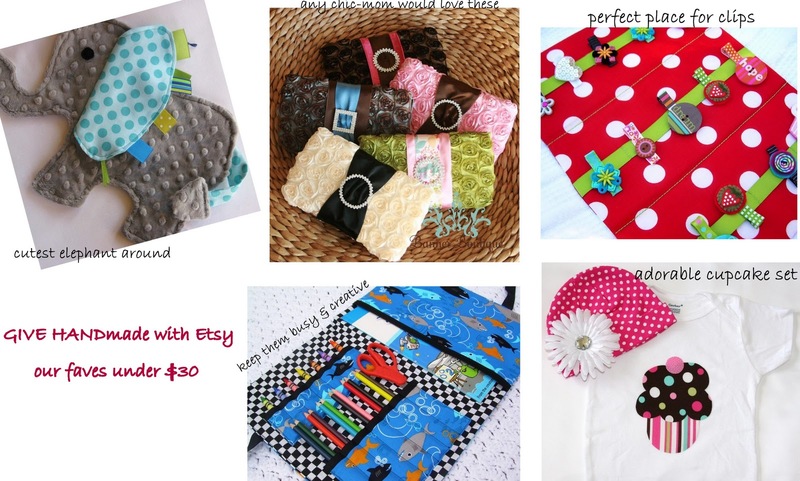 Stock on for your Little, for the next Holiday or the perfect present! You can get enough of the Monkey-Toe cuteness! with the all the great changes to come! We know - you have seen many tutus on our site over the past year but this handmade mommy-making tutu machine is by far, our favorite. 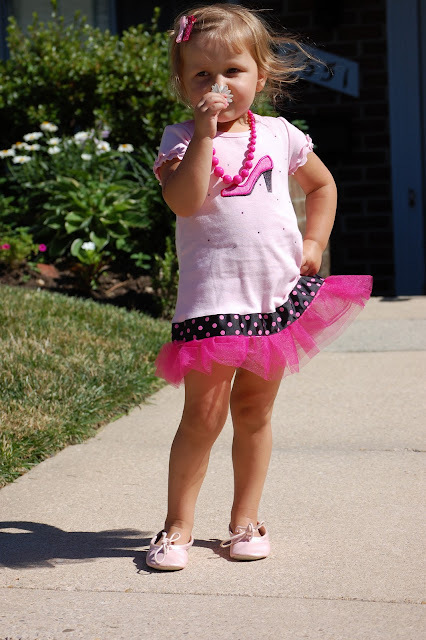 Have you heard of Cutie Pa Tutus? If not, you are missing out! In fact, they were just featured on E! Online - apparently, celebs are grapping up their goods and so are we - and have been! Our faves our the Pa Tutu outfits and Tee-Tu's and of course the super hero capes which we have already told you about here. We are absolutely drooling over the cuteness! The lovely owner Amanda (below) of Cutie Pa Tutus and Delicia of Kota Couture teamed up together to bring you the cutest tutu outfits around. It isn't just another tutu set - they are made well enough to hand down as the quality is superb - handmade sweetness! 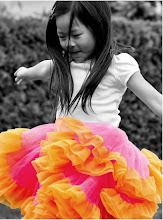 Also, un-like other tutus - you can wear them over and over again! They don't ruin once they are worn or washed. They are just tutu perfection. Have a little princess in your life? We are partial to the Kennadi onesie ($30), named after our editor's Little! Check it out here. How cute can you get? It also makes the perfect shower gift! Who doesn't love a tutu onesie? 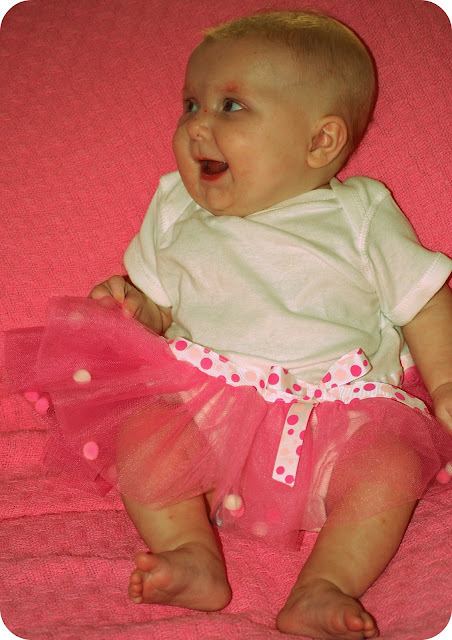 Kennadi in her Cutie Pa Tutu "Kennadi" Onesie! 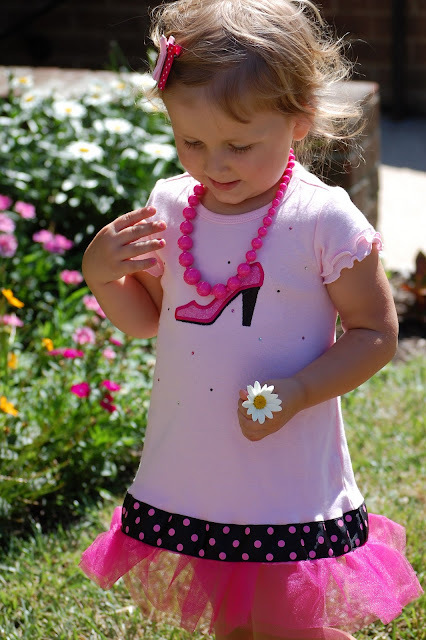 We love the Tee-Tu's for everyday wear but the Pa Tutu outfits make for a picture perfect special occasion. Birthday party? Grab one up to match your theme! They are just so cute - you will defintely be going back for more! 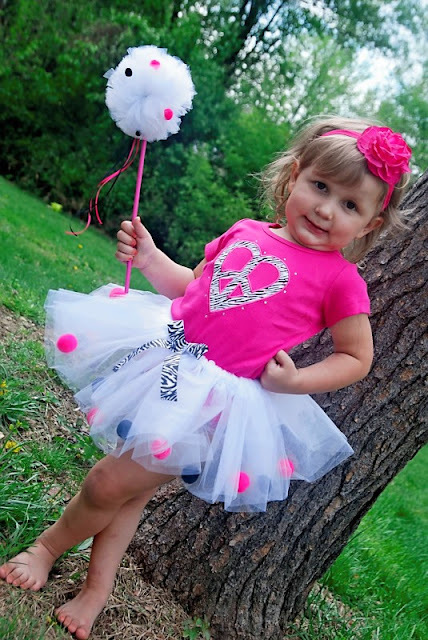 You could browse the shop for hours and end of spending a few hundred on the cutest little Pa Tutu's around! Seriously, head over now and get your tutu shop on! 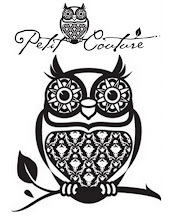 Make sure you follow Cutie Pa Tutus and Kota Couture on Twitter and check out Cutie Pa Tutus and Kota Couture on Facebook too! We are just loving "the cuddly crew" from Elegant Baby. The new line of plush baby blankets and stuffed animal toy ($32) make the perfect gift for your Little. The pink and orange elephant is precious for those who love to hug and cuddle. It comes wrapped around the softest fleece blanket you will ever touch! 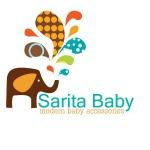 Check them out now on Elegant Baby - they are great for boys and girls! First birthday celebration for Oscar! 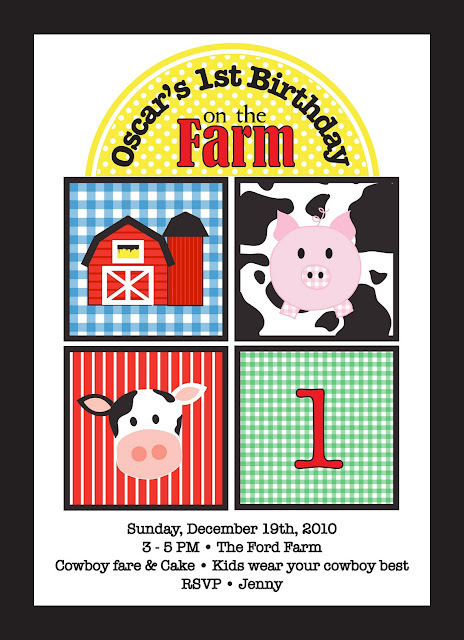 MOOOOO-VE over bland 1st birthday parties, here comes OOOOSCARS! Oh how much fun I had for this barnyard bash. I had many nights of insomnia with the list of “to dos” running through my head, so I found myself waking up at 5 am (which is completely unheard of for me – I’m an 8am to noon-ish kinda gal) getting busy. Cutting, taping, drawing, hair and finger nails flying (added the last one for a fun visual). All this hard work paid off when I heard the oooohs and ahhhhhs at his party! So here it is. 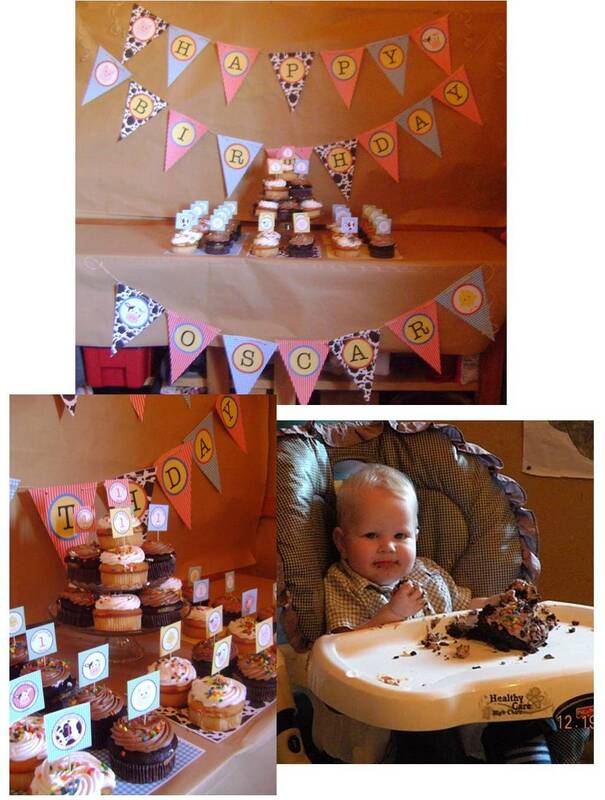 The long awaited Oscar’s first birthday party which was a HUGE success. (Even the hubs *admitted* he enjoyed it, and he was non-stop rolling his eyes at everything for the past 3 weeks – his eyes must HURT!) The details, which MADE the party, were supplied by Anders Ruff Designs and I couldn’t be more happy with their work. EVERYONE commented on the little bits scattered throughout the party. I thought it was adorable for Oscar to have his own logo. The (barn) stage was set with the invite, and everything from there coordinated. Can you say AH-DOOR-ABLE?? I had so much fun playing dj on itunes by creating a mix of Oscar’s Barnyard Beats. I had a little cowboy theme going with Wild Wild West (Will Smith), Dixieland Delight (Alabama), Should’ve been a Cowboy (Toby Keith) and tons more. I hope the kiddos enjoyed them on their ride home, and hopefully it didn’t drive the parents nuts by being to kidd-ish. Along with the cd’s, each cowpoke received their very own adorably hand decorated farm animal sugar cookie. Aren’t they sooo cute! They could choose from a horse, barn, cow, pig, chick or sheep. And they were quite yummy too! All created by Truly Scrumptious Cookies – so many fun designs. See those “winner” bags? Those are for the pin the tail on the donkey and pie eating contest winners. Oh the kiddos had so much fun playing. 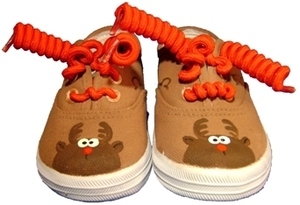 And of course, no farm party would be complete without Monkey Toes Wowie Cowie tennis shoes. I initially had the shoes, and Oscar’s non-traditional birthday hat – a cowboy hat - sitting on the entry table and then moved it on to the kids table to act as the centerpiece. Oscar did just what I suspected he would once I put the hat on his head, he grabbed it, smacked everyone in the face with it and then threw it to the ground. Gotta love 1 year olds! 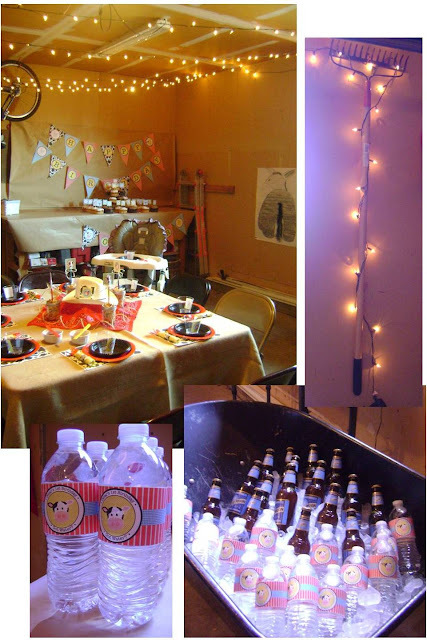 I tried to make the party space look as much like a barn as I could, so we held the party in the garage. I figured all the pots, tool boxes and lawnmower, etc were perfect “décor” for a barn, right?! I just incorporated it all into the scenery. We even strung lights across the ceiling of the garage for a “ho-down” kinda feel. I LOVE it, so much that I think I will leave them up – it’s like a party for our cars every time we drive into the garage. The wheel barrow was the perfect place to house the cold beverages! Look how cute those “Got Water” labels turned out. I heard many whispers of “oh my gosh, I can’t believe Oscar has his own water bottle labels, how CUTE!”. 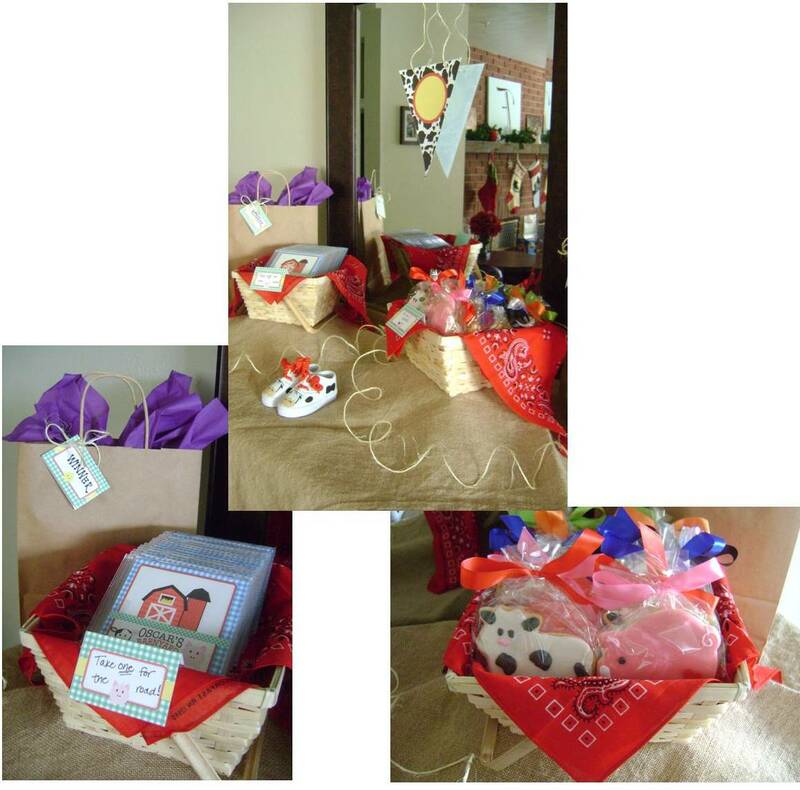 The kiddos were greeted with their own burlap covered table filled with all sorts of goodies, when they walked into the garage – oops, I mean BARN. Each lil cowpoke had a cowboy hat with name tag, and their tagged cups dictated where they would be sitting (ah, this left out any arguing over who was going to sit by who! Crisis averted - Yay me!!). I had this bright idea for centerpieces in the middle of the night – a mason jar filled with animal crackers and peeking out – a colored pencil topped with the cute little tags made by Anders Ruff. EASY PEASY! And cute to boot! (HA! I am a dork). And since Oscar would chuck his hat any time it was near him, it sat in the center. For games, I really wanted tons of giggles from the kiddos so we went back to basics. 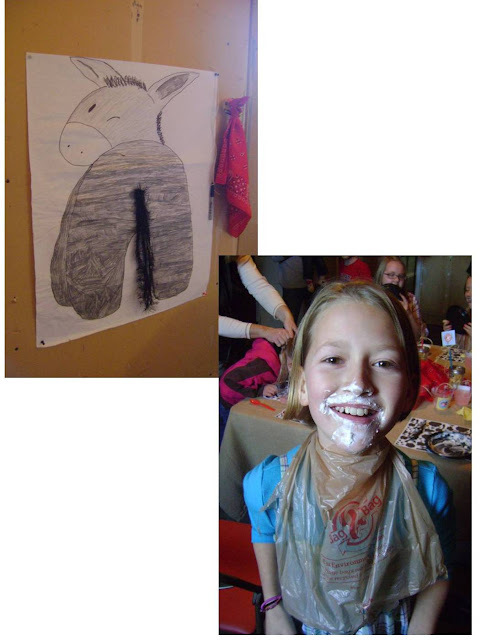 A good old fashioned game of pin the tail on the donkey and a pie eating contest. I drew the donkey, my oldest daughter colored it, and made the tail by cutting a ton of fuzzy yarn and hot gluing it to a square of card stock. The kids had so much fun being spun around and around – I was amazed at their pinning skills! All the kids helped out and were squealing. The pie eating contest was a hit too! Of course I wouldn’t let them use their hands. HAHA! Whipped cream EVERYWHERE! They loved getting a little messy for a good cause – a clean plate. To make bibs – I cut plastic shopping bags in half and the handles served as the ties. Cheap, easy and fun! Ok, Ok, on to the most important thing at a birthday party – CAKE! I decided not to go the traditional route of a giant cake, I went with mini err, gigantic cupcakes from Costco (GASP! Don’t knock it until you try it, their cakes are DEEE-LISH!) I’m a cake person, if you can’t tell. To make things easy on me, so I didn’t have to do any baking or re-frosting, I decided to just add a toothpick to those cute little tags and slap them right on top of the store-bought cupcakes. Again, easy, and made a great statement. 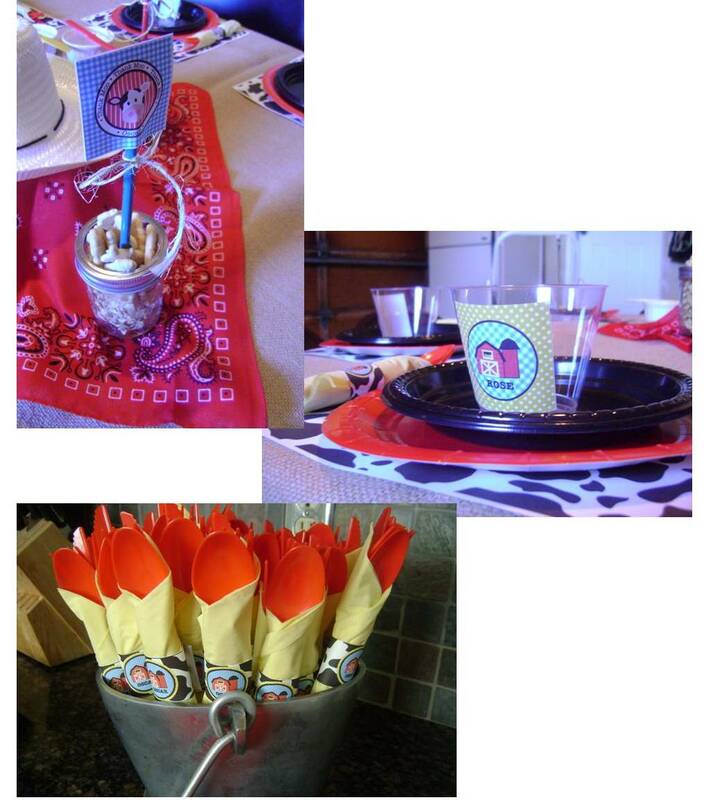 I even created cow print placemats from some of the Anders Ruff printables they sent. And lastly, we cannot forget the birthday boy and his first GIANT cupcake! I think he was a little overwhelmed by this monstrosity, but we all coerced him into eating it. And that he did! (Oscar is definitely my child with the way he smashed that cake into his mouth) He was so messy we had a “hay-day” (pun intended) getting him clean again. I swear with a toddler you need a disposal installed on the tub. I’m pretty sure Oscar had a great time at his party. Ok, he had no idea it was his party, but he didn’t cry, scream or throw any tantrums, so I am taking that as a “I loved it” stamp of approval! Thank you to Anders Ruff who provided me with all of the gorgeous printables for this party! I would have NEVER been able to pull this all together without you!! And now on to the next party in March - YIKES. 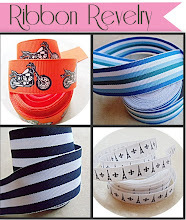 So here is what you MUST do - go visit Anders Ruff's Blog - they're giving away a pair of Monkey Toes! (just like Oscar is wearing) WOOT! And while you're waiting to win that pair of Monkey Toes - make SURE you visit Anders Ruff Designs on Etsy and start daydreaming up your next soiree. Thank you for all your support this year! We are so grateful for all the LOVE we have received! We can't wait for what 2011 brings! PS - We are saving trees by being eco-chic and showing off our card here! We absolutely adore Janey Mac! You will have to stay tuned for our photo shoot on cupcakeMAG but until then we recently came across something we just LOVE on their blog! How cute is this growth chart? Our Littles love to see how much they have grown so why not turn it into art on the wall. This wall decal isn't available yet but check out the oh so cute ones that we are just drooling over! 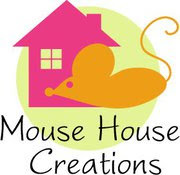 We came across them on Etsy a few months ago and just love following them! 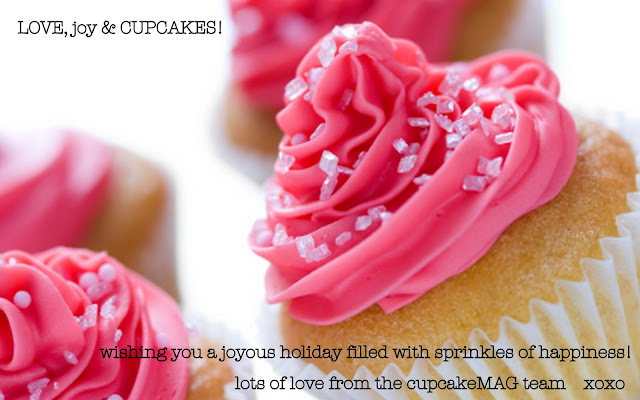 Stay tuned for more from Janey Mac on cupcakeMAG! shine through in the Ivy + Bean series! read them over and over. 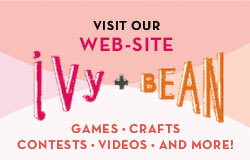 Check out the Ivy & Beah website from Chroncile Books now! 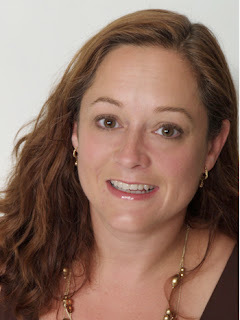 Meet the author here & grab up one of the best series around for your Little! We are just dying over this outfit we just spotted Kourtney Kardashian in a few days ago! She is wearing a to-die for Rachel Roy top, vintage belt, Citizens of Humanity jeans, Balenciaga flats, and an amazing Balenciaga bag with of course - Balenciaga sunglasses. She exemplifies chic-mom and we love it! 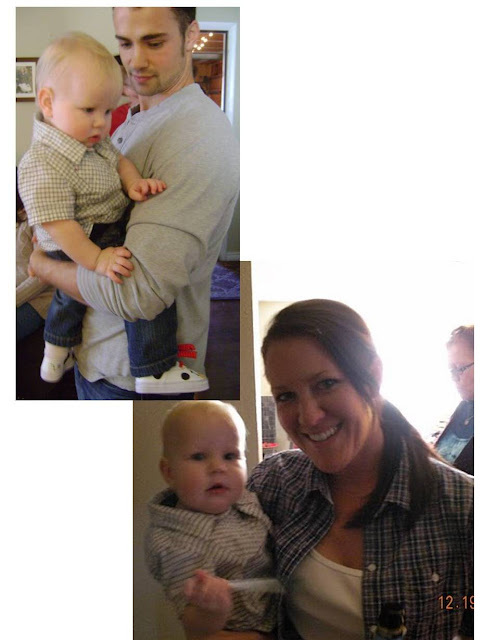 As for Mason - he is wearing a super-cute plaid Acoustic top, H+M jeans and the cutest Ugg shoes. Head over to her blog to see more pictures now. Best of the Best :2010 -- The Super-Swank Orbit! When you have a Little a stroller is one of those must-have investments. From the day they are born until they are a toddler - the stroller is your new best friend. That is why we are so thankful for a little thing called the Orbit Stroller Travel System G2. Oh yes, it is FABulous which is why it made our Best of the Best for 2010. And well, years to come! So how can we truly love a stroller? It is simple. The Orbit is a system. Not just a stroller but an all in one on-the-go must. If you have been paying attention to all the super-chic celebs moms then we are sure you have spotted The Orbit. It has been on our radar for quite sometime now and isn't going off anytime soon with celebs like Marcia Cross, Halle Berre, Kourtney Kardashian and Kendra just to name a few pushin' it all over town. The stroller is like no other with the 360 degrees on the stroller you can dock and rotate your babe. The innovative QuadShock™ suspension gives your Little an uber-smooth ride & hassle-free no-pump tires. 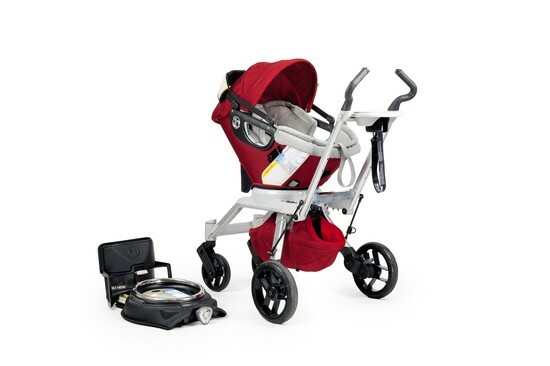 The all-in-one travel system includes not just the stroller but the infant car seat (up to 22lbs) and base too! The soft handle won't leave a mark on your arm when carrying from one place to another like most car seats do -- it is a super comfortable carrier handle. As for the one-hand pull 19 lb stroller - it easily folds down in one little step. We also adore The Orbit's extra safety as each car seat is built for side impact protection. Safety first! Stay tuned for more Orbit coverage from cupcakeMAG as we show it off in a Posh Baby photo shoot we have been working on for months- debuting on our new site. Make sure you look out for the Orbit Travel System giveaway too! We just can't say how much we LOVE it enough. It is the "IT" stroller! Holiday time is the perfect time of year to break out the party games so we wanted to be sure to share with you a very special offer. While supplies last, Hasbro's Facebook page for adult party games, Game Night Fun, is offering FREE booster cards for two crowd pleasing games: TABOO and THE GAME OF THINGS... These cards feature custom content that spotlight news and events of 2010. 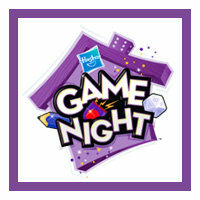 Redeem this offer by visiting: www.facebook.com/gamenightfun and look for the Special Offer tab. Wishing you and your families a wonderful holiday season. May the new year be filled with many happy game nights! Just in from Miss Brittany! Just in all the way from New Zealand is the one & only - Design Your Own Superhero kits - just in time for the holidays! Your Little will be thrilled to create their very own superhero, while engaging in creative play. 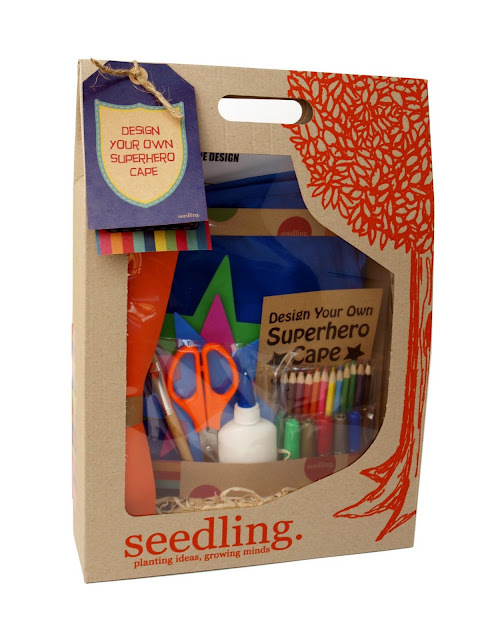 Each kit contains a superhero cape, colored pencils, craft glue and brush, stars and design sheets, glitter glue, scissors, and a design page filled with ideas for all sorts of superhero-tastic fun! Packaging is eco friendly, made up of high quality art supplies, and designed by the New Zealand based company Seedlings. Get one now! They will be available to ship as of 12/20 and they will send them priority at no extra charge so you can get them just in time! 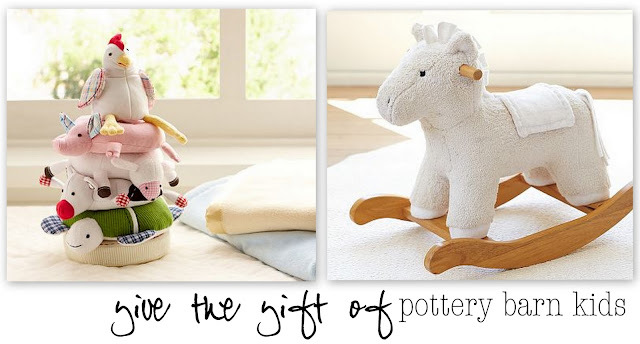 The Perfect Presents from Pottery Barn Kids! Last minute shopping? Pottery Barn Kids can help! We could give you a list a mile long from their so-pretty site full of so-pretty things but we are just dying over the cuteness over these two perfect gifts! 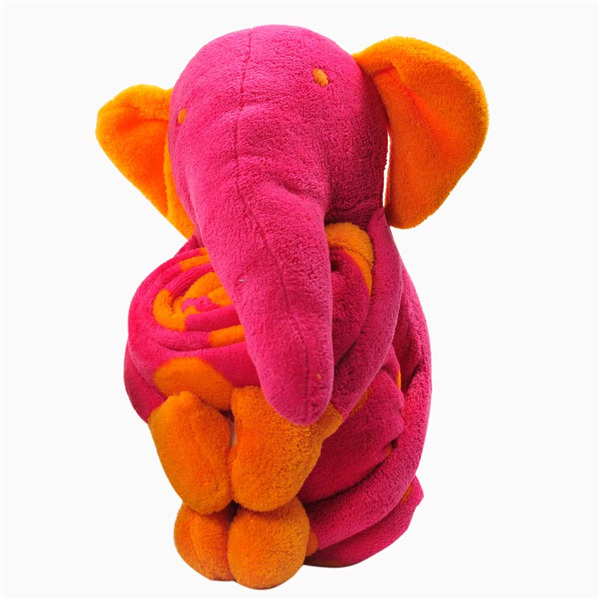 Not only does it just look pretty in a room but your Little will love this soft plush toy. A classic stacking toy with that perfect Pottery Barn style. Can you just imagine the look on your Littles face when they see this under the tree? Priceless. Perfect for those little riders this rocking horse is covered with the softest chamois fleece. We wish they had a blanket in adult size to match - it is so soft you just want to snuggle it. The runners are crafted of solid wood and make the horse even more beautiful - the perfect smooth, secure and gentle rocking motion. Stay tuned, these items and more from Pottery Barn Kids will be featured in our Posh Living photo shoot debuting on our new site in the Spring! 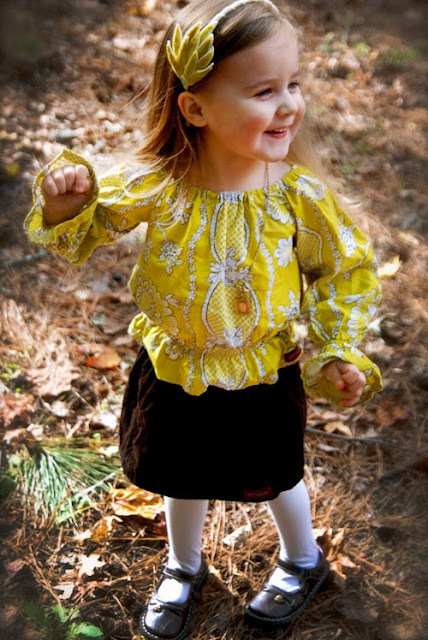 always OBSESSED with Laken & Lila -- giveaway too! You probably have already heard us rave about Laken & Lila here but, we just can't help it. This is one of favorite Etsy shops. 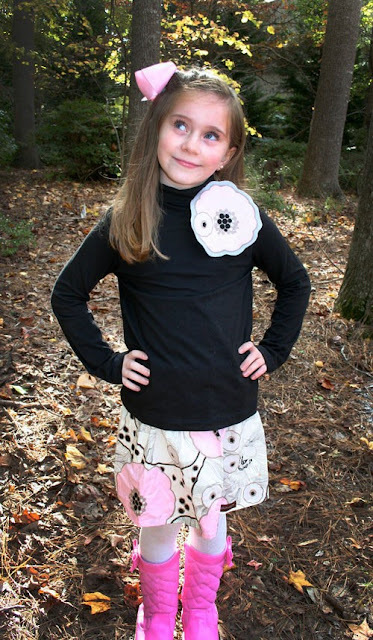 Heather designs the cutest clothes for your Littles that you won't see everywhere! HANDmade with love, unique and just utterly fabulous. We adore them....to pieces! The Ramona Outfit $52.50 is not your average ensemble! 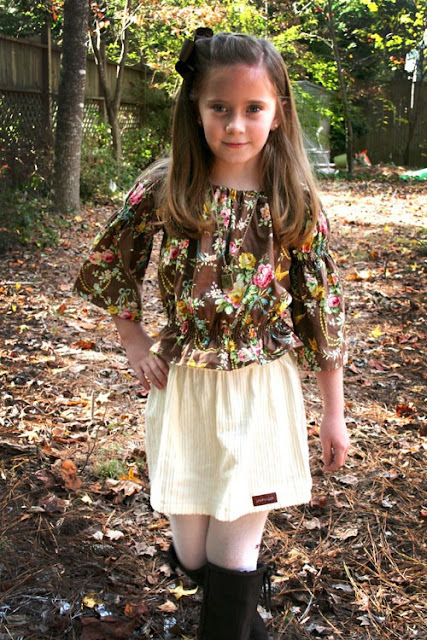 The smocked peasant top & skirt are just precious! The Zara - oh so fancy! $52.50 - we swoon over the winter white swirl skirt & fancy floral top! Soooo cute right? Everyone falls right in love with this shop. So head over now, you can still save 15% off your order by using code HOLIDAYSALE and any skirts, mix & match are buy 2 get 1 FREE! We love a sale! But WAIT - we want to share the Laken & Lila LOVE so we are giving you a chance to win a $25 gift certificate to the shop! This isn't your average bike. CUTE. STYLISH. FUN. That defines the Whirl Balance Scooter ($110) from Prince Lionheart. Well, that isn't all. It also teaches balance, coordination and confidence. And basically, your Little will be the coolest on the block with these wheels. what WE love: height adjustable, padded seat (15in-18.5in. 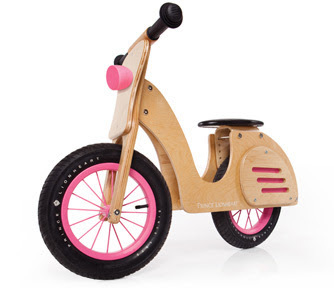 ), 12 in rubber tires, 100% birch from from an FSC certified forest - can we say eco-chic? Yep, it sure is! Oh, and lets not forget the solid rubber handgrips. It is the perfect ride for ages 2-5! Your Little will gain a sense of independence and their confidence will shine as they learn how to balance and steer: first walking, then gliding! Have a boy? 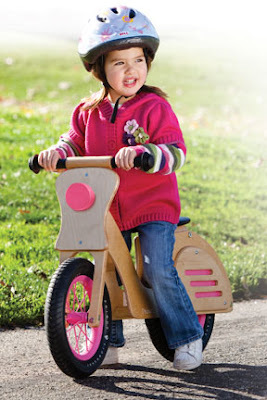 Check out the Chop Balance Bike! Need a last minute gift for under the tree? Well, we are giving you a chance to win your very own, well your Littles very own, Pink Whirl Balance Scooter! Read on to win! As you know I usually don't write personally unless it is in the Editor's Note each month BUT this is such HUGE news - I couldn't wait to share. I was literally jumping up & down (true story) when I found out SWEET HARPER is back! What is Sweet Harper? 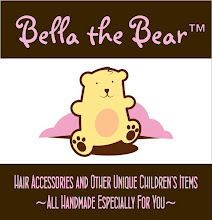 The cutest most amazing hair clips for girls ever! period. Well, exclamantion point! I am just dying with excitment. The shop isn't full yet but keep checking back. I promise, Sweet Harper clips are just amazing and the designer herself is even more amazing. We at cupcakeMAG for Littles are defintely her number one fan. And you can't take that label from us! Yay for Sweet Harper. Get shopping now. Sweet Harper re-opened just in time for the holidays. ahhh, that hole in my heart is filled again. Sweet Harper is back! Should we just keep saying it as we jump up down? Looking for something to do on those rainy days? Pottery Barn Kids has something beyond perfect. The Alphabet Learning Game ($49) has quickly become a favorite for our Littles. It isn't just a "toy" - it teaches those eager to learn little brains! We love the brightly colored Alphabet Chart with corresponding picture and word cards that perfectly fit in each of the beautifully embodied letter. This is your preschool teachers best friend. The cotton canvas easily hangs on the wall with corner grommets and is the perfect addition to any playroom. Personalize it for only $6.50 more -- you know we love a little monogram! And guess what? It ships free from Pottery Barn Kids so grab one now! Holiday Gift Guide for the Babes! Check out our favorites for the Littles in your life on Etsy. We share with you our top 5 items for under $30! 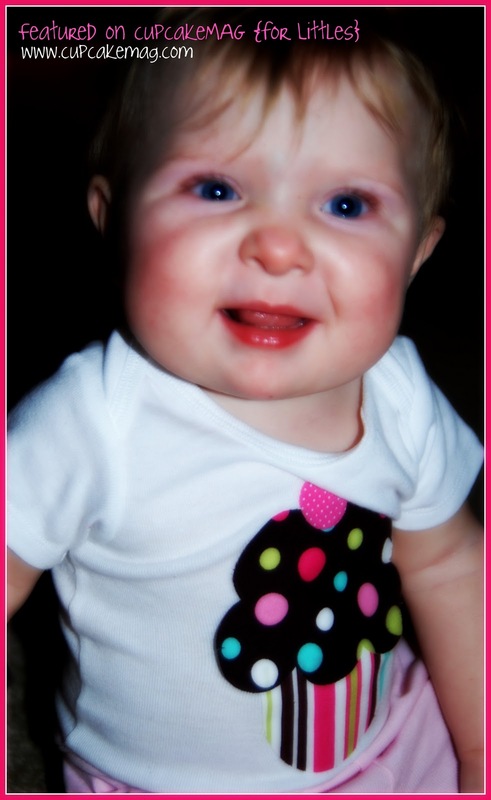 Isn't this an oh so sweet onesie from Amy's Buttons & Bows? We love it! 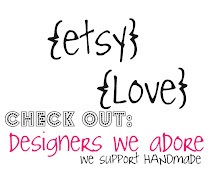 We just love all of these Etsy shops so much so browse around and grab something for the special Little in your life! Little, Brown Books for Young Readers keeps us reading! We couldn't wait to share with you some of our favorite titles for the Holiday - buying for your Little for Christmas, or just looking for some great titles to add to your book shelf? Little, Brown Books has them! The last few weeks we have been catching up on our reading and wanted to share with you a few of our top Holiday titles for the perfect gift! Critically acclaimed pop-up engineer Matthew Reinhart celebrates the rich history, heroes, and villains of the DC Universe in this spectacular pop-up adventure. 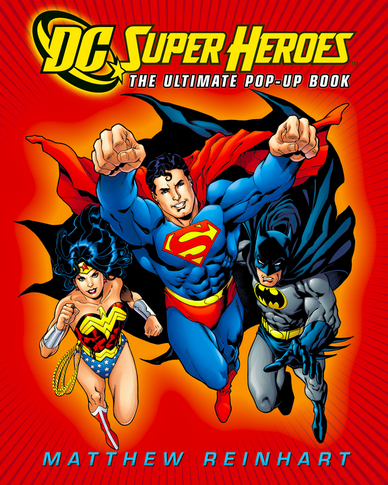 Just in time for DC Comics’ 75th anniversary, this book features over 25 impressive pop-ups of all the favorite DC characters with unique novelty elements including a light-up bat signal and a show-stopping final spread. This book is a must-have for every superhero fan! Wish baby a very merry Christmas with this cuddly new lift-the-flap board book! With heartfelt rhymes and engaging illustrations, this interactive novelty book will have babies and loved ones merrily reading and playing along right through to the glittering Christmas tree finale. While frolicking through the woods, Lucy, a young bear, happens upon a lost boy, whom she finds to be the most adorable pet ever. Even though her mom warns her that “children make terrible pets,” Lucy insists on keeping her boy, and names him Squeakers. But Squeakers proves to be a handful; he jumps on furniture, he starts food fights, and he is not so easy to potty train! Lucy learns some important lessons about having a pet and eventually realizes that some “animals” are meant to be free. For all you GLEE! 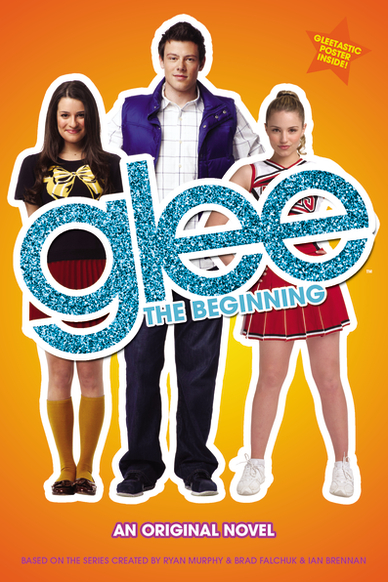 fans - we know there are a lot of you - we have the perfect star-in-the-making book for you - Glee: The Beginning by Sophia Lowell, $9.99. Ever wonder where Rachel, Kurt, Finn and the rest of the gang were before Will Shuester took over the Glee Club? 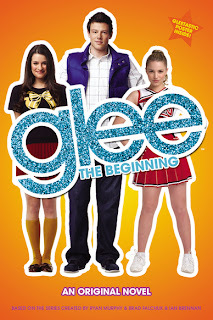 This exciting Glee prequel is all about the halls of McKinley High before the dance moves, costumes and mash-ups began. Bursting with the same comedic sensibility and quirky, heartfelt storylines, this first novel in the GLEE publishing program really is just the beginning! 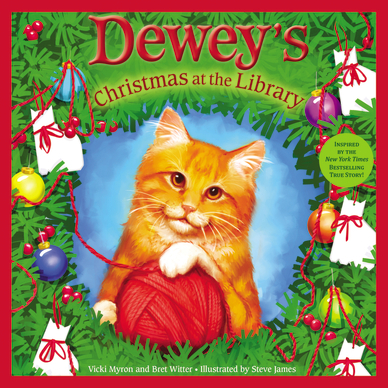 Another precious favorite for the Animal Lover is DEWEY’S CHRISTMAS AT THE LIBRARY by Vicki Myron and Bret Witter, illus. by Steve James, $16.99. In the newest adventure in The New York Times bestselling Dewey books, the holiday season is in full swing at the Spencer library. The lights are twinkling, the wreaths are hung, and the presents are wrapped. Full of Christmas cheer, Dewey longs to become a part of the holiday fun. After a series of silly misadventures, he finally finds his very own way to add a special touch to the holiday. 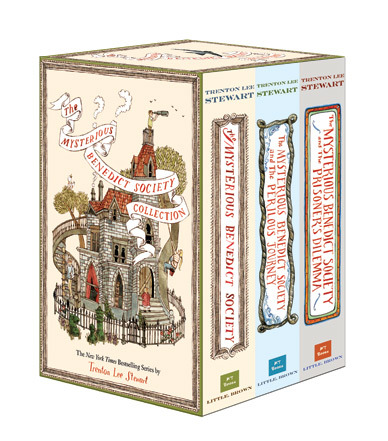 MYSTERIOUS BENEDICT SOCIETY COLLECTION, $21.99. Join The Mysterious Benedict Society as Reynie, Kate, Sticky, and Constance embark on their daring missions in the first three adventures of Trenton Lee Stewart’s New York Times bestselling series: The Mysterious Benedict Society, The Mysterious Benedict Society and the Perilous Journey, and The Mysterious Benedict Society and the Prisoner's Dilemma. Filled with page-turning action and mind-bending brain teasers, these wildly inventive journeys are sure to delight in this gorgeous collector’s set. So head over to Little, Brown Books now or your local Barnes & Nobles! Oh, and check them out on Facebook to for all their updates! We just adore Little, Brown Books! Razzeberry Tutu's plus a giveaway! Perfect Sew Cute Tees for the Holidays!